Episode 2 of ITV’s extraordinary The Great War: The People’s Story is now available on ITV Player. The series continues the real-life stories of Reg Evans (Daniel Mays), shot in the face in the trenches, as he undergoes pioneering plastic surgery – and of Alan Lloyd (Matthew McNullty), who has swapped life with his new wife and baby son for the battlefields of Ypres and the Somme. But it also explores war on the Home Front – through the diaries of fashionable celebrity cook and restaurateur Hallie Miles (Alison Steadman) and suffragette Kate Parry Frye (Romola Garai), as they see the old Edwardian world crumble around them, opening up ever more opportunities for women, as ever more men – including their own loved ones – and sent to fight and die at the Front. Available for the next 30 days. Episode 1 is available for the next 3 weeks. Tune in Sunday 17 August at 9PM for episode two of ITV’s compelling The Great War: The People’s Story. You can catch up with episode one of ITV’s compelling The Great War: The People’s Story on ITV Player. 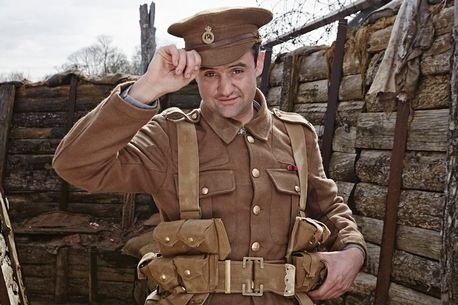 Tune in tonight at 9PM to see Daniel Mays in episode one of ITV’s The Great War: The People’s Story. Tune in tomorrow evening at 9pm for episode one of ITV’s The Great War: The People’s Story. The 4 episodes tell the real-life stories of soldiers, from privates to officers, their wives and girlfriends left behind, and people from Britain’s villages and cities. They are portrayed by a cast of actors including Alison Steadman, Daniel Mays, Claire Foy, Brian Cox, Romola Garai, MyAnna Buring and Matthew McNulty, who speak their words as they were written in their diaries and letters. These moving accounts, revealing their intimate thoughts and feelings offer a raw insight into the profound impact of being caught up in a conflict that would change their lives – and Britain – forever. Sourced from archives and libraries across the country, selected in partnership with Imperial War Museums, which provided much of the material, and brought to life by actors – each story conveys the hopes, fears, heroism and tragedies of countless ordinary British people… made all the more powerful by the fact that every word is real. Daniel Mays stars in episodes 1&2.